Welcome to Critic's Notebook, a quick and off-the-cuff car review consisting of impressions, jottings, and marginalia regarding whatever The Drive writers happen to be driving. Today's edition: the 2018 Volkswagen Golf Alltrack S.
Quick Take: Cheaper than an Audi and sharper than a Subaru, this lifted Golf wagon offers copious cargo space and all-terrain capability to those tempted to cross over. But the spartan base model might have you looking elsewhere for adventure. See all 2018 Volkswagen Golf Alltrack specs and pricing here. One Big Question: Is the VW Golf Alltrack more than just a quirky middle finger to the rise of SUVs? Form follows function. Louis Sullivan was writing a manifesto on the 20th century office building when he coined the now-famous architectural axiom in 1896, but the full text shows he might as well have been describing the modern crossover. After laying out the reasons why tall towers have become a necessity, he sums the dilemma facing architects thusly. Problem: How shall we impart to this sterile pile, this crude, harsh, brutal agglomeration, this stark, staring exclamation of eternal strife, the graciousness of those higher forms of sensibility and culture that rest on the lower and fiercer passions? Translation: How do we make these make these ugly things intellectually and artistically worthwhile? The answer doesn't lie in disguising them with frippery or trickery, according to Sullivan. Like everything in nature, he writes, the shape and design of the modern skyscraper should simply mirror its true purpose. Form ever follows function, and this is the law. 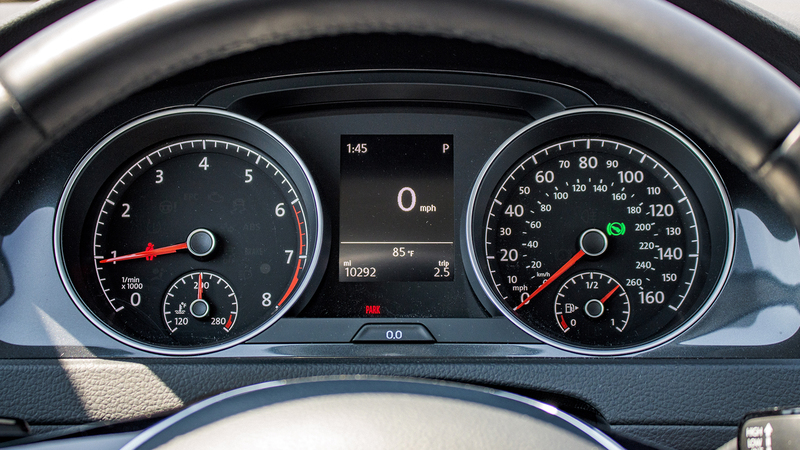 Digging into the good and the bad of the Alltrack's infotainment system. Likewise, there are a whole bunch of reasons why crossovers are suddenly the automotive flavor of the month, from their generally improved driving dynamics to our crumbling roads to humanity's unceasing quest for more. Manufacturers have responded in kind with new models of all shapes and sizes—as long as you're looking for a blobby, two-box-looking thing with melting lines and about as much character as an office park. Every crossover pretty much follows the same form because they're all built to satisfy the same needs. But Sullivan himself wanted the whole "form follows function" dictum to help guide creation, not stifle it. 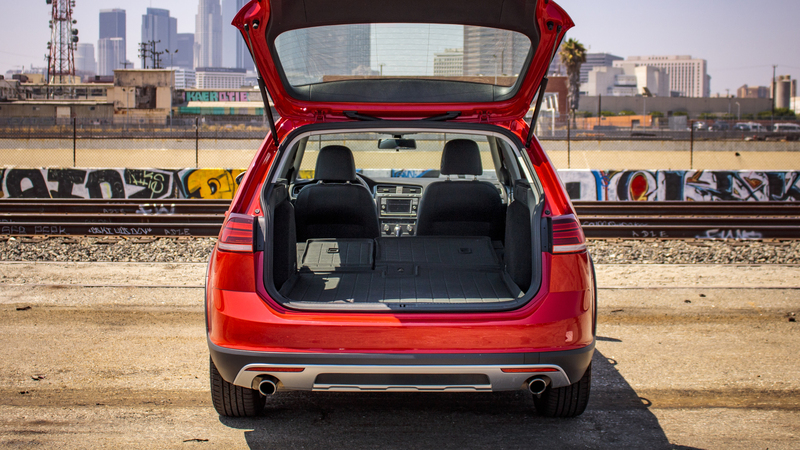 So if the ultimate function of a crossover is to safely carry you, your family, and many cubic feet of stuff on all-wheel drive wings, then something slightly unorthodox like the 2018 Volkswagen Golf Alltrack should be a suitable replacement. The lifted station wagon is nothing new (and neither is an off-roady Golf, for that matter)—but in a world where Subarus are flying off the lot and tiny CUVs reign supreme, the idea behind the Alltrack is more interesting and relevant than ever. Is it any good, though? 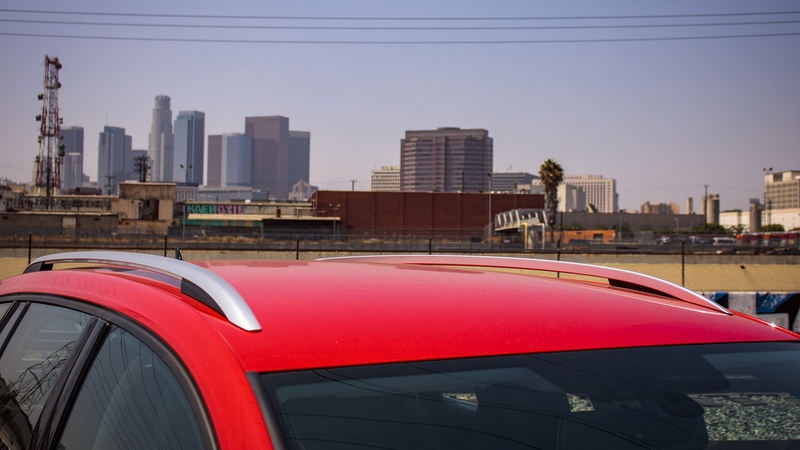 To get the truest possible picture, The Drive borrowed a base S model for a week of bouncing around Los Angeles. There are few things we automotive weirdos love to perseverate more on than station wagons, and the Golf Alltrack shows once again how every crossover could be improved with a lowered profile and a longer roof. The Golf Mk7 design language has been slightly freshened for 2018 with new LED daytime running lights and taillights, but little else has changed. Part of the model's charm has always been its iconic shape; the current style translates into a wagon nicely, especially with those thin structural pillars. 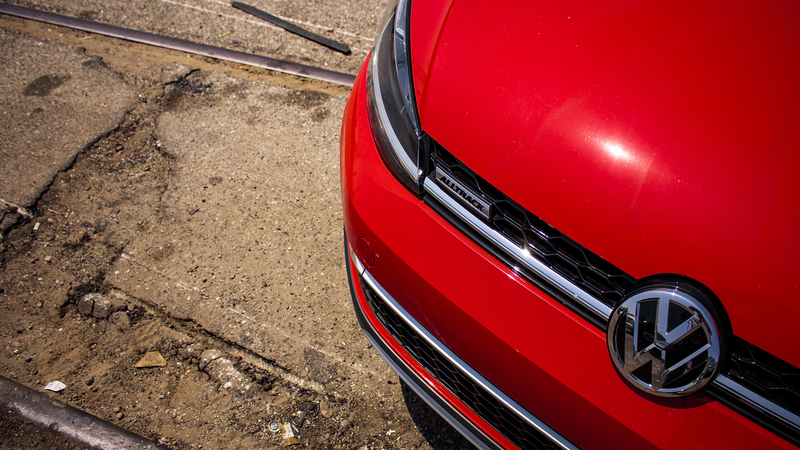 And the Alltrack wears its plastic body cladding better than most. It's a handsome machine. I last drove the Alltrack on a frozen lake in the wilds of Quebec this winter, where the standard 4Motion all-wheel-drive system (plus the manual handbrake) made it a surprisingly good drift car on the ice. The Haldex-based 4Motion isn't quite as capable as Subaru's symmetrical AWD or performance-oriented as Audi's old-school Quattro systems, but it's more than enough to maintain grip on a slippery road. 6.65 inches of ground clearance would suggest the Alltrack can't keep up with, say, a Subaru Crosstrek on a rutted trail; then again, that's still more than crossovers like the new Toyota RAV4. The Alltrack also comes with an off-road driving mode that adjusts throttle response, controls wheelspin, and offers a hill descent feature. Again, more than a lot of CUVs. 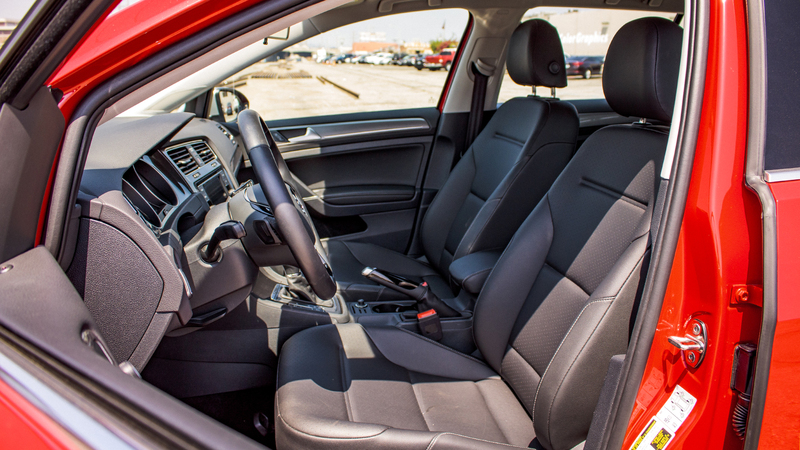 The interior's form follows its function in the best way possible. In a cheaper car like this, the dashboard doesn't have to be a piece of modern art—it just has to keep the car's important buttons and relevant information laid out in a logical, accessible order. With the exception of a poorly-placed USB port buried deep in the cubby under the climate control knobs, everything felt sensibly organized. 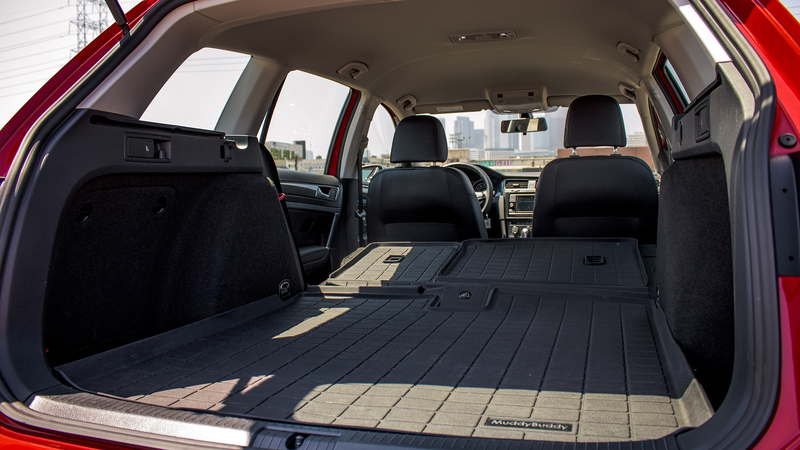 The Alltrack can comfortably seat five despite average rear-seat legroom (35.6 inches), and the cargo space (66.5 cubic feet behind the front seats) is just a few cubes shy of the larger Subaru Outback. 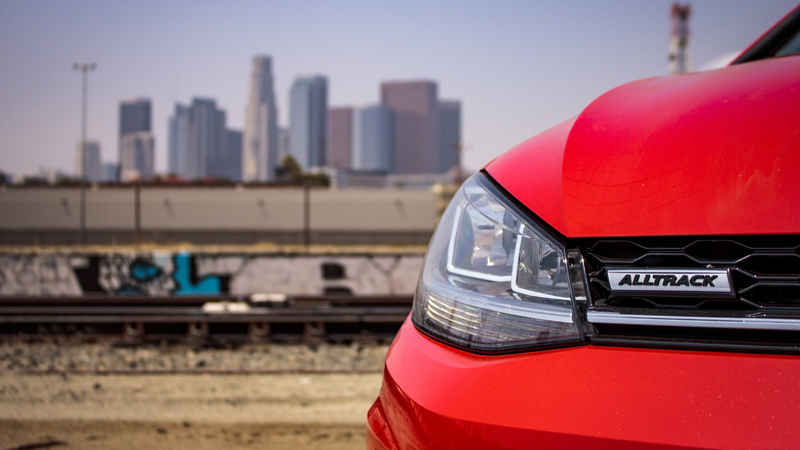 It should come as no surprise that a Volkswagen Golf is sharp on the roads. Despite the taller tires and longer springs of the Alltrack, it remains a tactile handler that greets each oncoming curve with the verve of its delinquent GTI and R siblings, if not quite the same vigor. Other reviewers have complained about the steering; I'll agree that it's a little light in normal mode, but Sport gives it some much-needed weight in your hands. Short of the Audi A4 Allroad, it's the smoothest-driving lifted wagon out there. 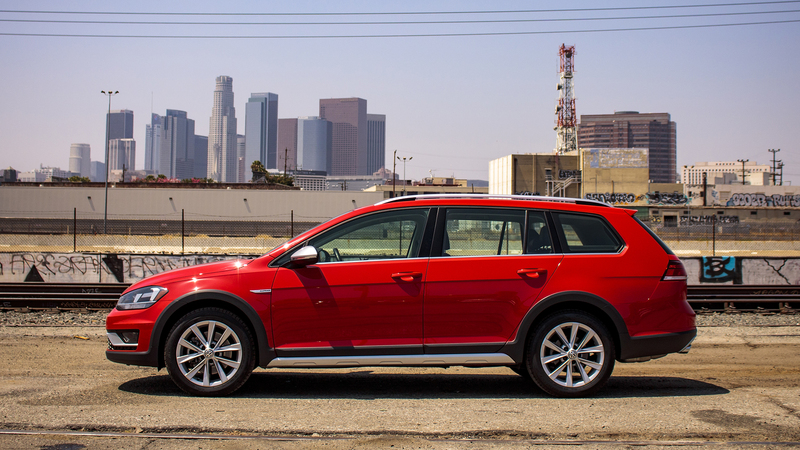 The Alltrack isn't quite as out-and-out goofy as the old Golf Country, but it still represents the same sort of creativity that Sullivan hoped would flourish once the foundation had been set. Volkswagen knows people want all-wheel-drive and a big old trunk; the decision to lift a Golf station wagon instead of developing some mysterious "white space" crossover shows that not everything has to be the same. 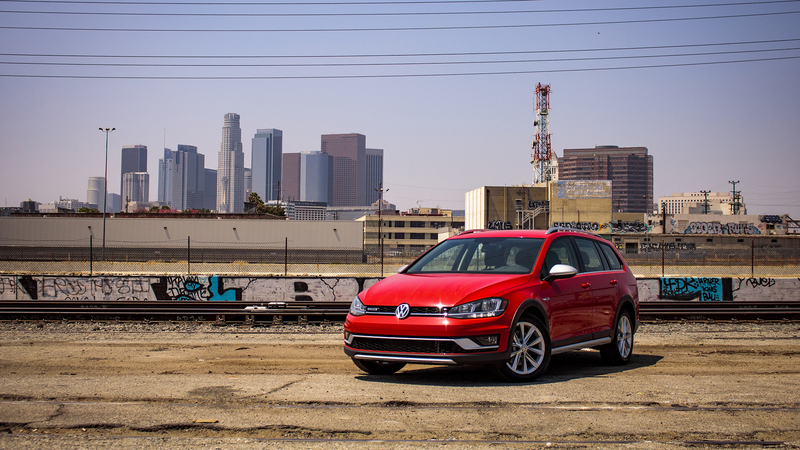 The Golf Alltrack shines in the corners—but in a straight line, it's borderline-underpowered. Your only engine option is a 1.8-liter four-cylinder turbo, and all the audible whooshing in the world don't make up for the fact that 170 horsepower just isn't enough to make 3,500 pounds of car do much of anything with haste. My experience was compounded by a dual-clutch transmission that was strangely slow to both upshift in traffic and downshift for a highway pass. Do yourself (and the world) a favor and grab the manual—you'll also save $1,100. The top-of-the-line SEL model gets you a standard suite of driver assistance features, including adaptive cruise control, blind spot monitor, lane keep assist, automatic emergency braking, and more. The base S model ($25,955) gets none of that, at a time where a lot of other manufacturers like Toyota and Hyundai have made this stuff standard in their cheaper economy cars. If these things are important to you (as they are to most crossover buyers) and the cheapest Alltrack sits near the top of your budget, the math doesn't work. Sensible as the interior is, there were a few issues that had me singing the base model blues. A full power driver's seat is only available on the SEL trim, which seems like a weird place to cheap out. That USB port I complained about is the only USB port in the car—another place where the Alltrack is bested by cars thousands of dollars cheaper. And the thin steering wheel felt incongruously hard in my hands. It must be admitted that the lifted wagon form does offer slightly less functionality than a lot of SUVs, especially in this smaller size. 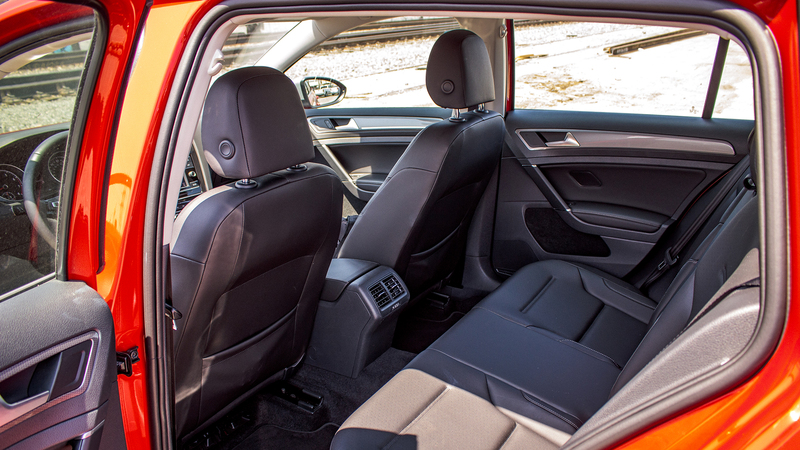 Outside of certain compact crossovers, the Golf Alltrack is down a bit on cargo space, ground clearance, and passenger buffer zones compared to a lot of other things out there. That wouldn't make a difference in the daily lives of most buyers...but for some, it would be all the difference in the world. Volkswagen doesn't offer any options on the Alltrack, just a totem pole of S, SE, and SEL trims that each offer more fancy than the one before it. That includes the base S model, which technically gives you more features than not having a car at all—that's pretty much all we can say about it. There's nothing wrong with a spartan base model, but there's something about being in the cheapest version of a vehicle that can get pretty pricey that makes it seem exactly that: cheap. I'd go with the midlevel SE trim for around $30,000, which adds a few key touches like a panoramic sunroof and the 8.0-inch infotainment system while maintaining the manual transmission option (it's not available on the SEL). Sullivan ended his manifesto on form and function with a hopeful prediction. Once everyone is on the same page, he writes, the resulting architecture of these once-hopeless buildings will eventually blossom into fine art in the true...best sense of the word, an art that will live because it will be of the people, for the people, and by the people. It's ironic that it ended up being Volkswagen—you know, the People's Car—who realized that the functions of a crossover can be nearly satisfied by a better form. 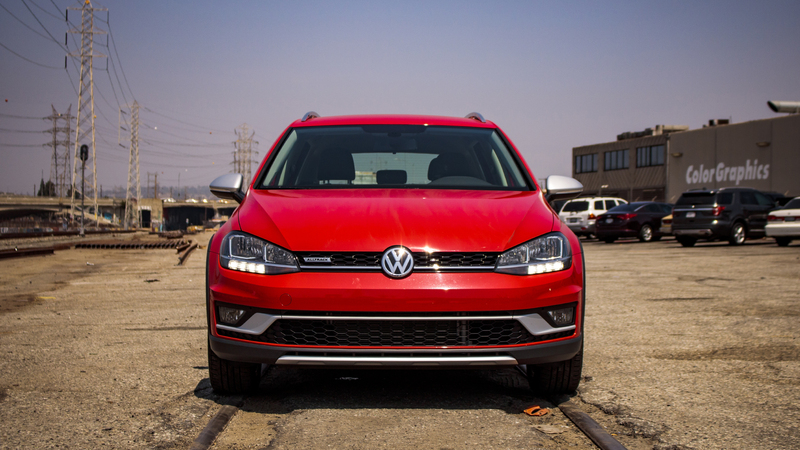 The VW Golf Alltrack is an indisputable statement that we need not all drive SUVs. Just know that you're paying for the ability to say so loudly and proudly. Sadly, there are rumors there are rumors going about that Volkswagen might be dropping the station wagon body style from the next-generation Golf—and with it, the next Alltrack. Sales have not been great this year. That often happens with great art, though. It goes unappreciated in its time.